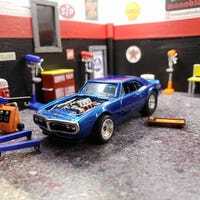 I’ve gotten a few requests to post more pictures of my garage diorama (that my mom and I built together from scratch) so here goes. Picked up a Racing Champions Pit Crew set on eBay for a great price the other day. Figured LaLeMans was a good opportunity to mess around with it. I’ve been having fun with Duplicolor metalcast paint lately, so once I opened up a Majorette Vision GT car I had an idea: spray metalcast directly over the factory silver paint for a deep candy red, add some sweet wheels and slam it. Here’s the result! The S2K contest goes on. Thank you to my supporters. LaLD Engine Week: 8 cylinder Nissan! Love me some American muscle but I had to mix it up and throw a Japanese V8 Prototype Racecar at ya! Rockin’ a 3.5L Twin Turbocharged V8 that boasted around 800 HP, this Nissan R90CP was a beast!